Inspired by an uplifting photoshoot with a remarkable team two years ago, I was energized to do something similar once again. 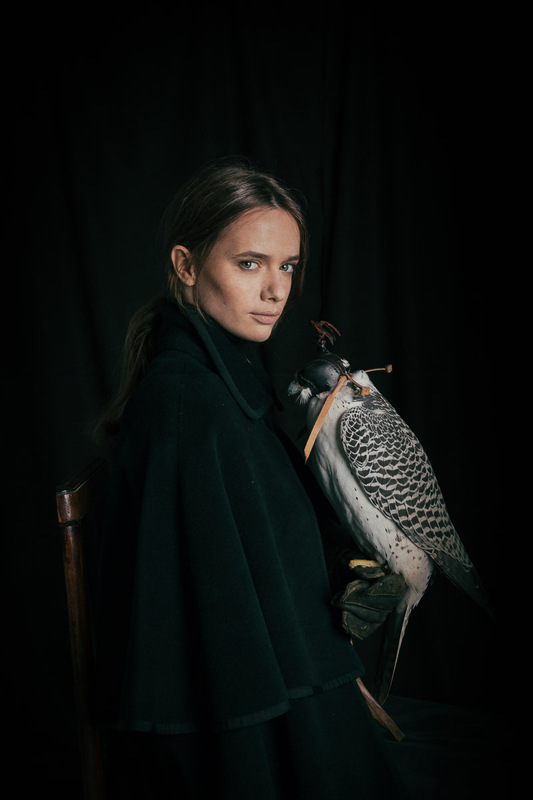 I have always been fascinated by birds and their stoic and powerful beauty, so last year we planned to do a session with an eagle and a model. Unfortunately, we had to cancel the project due to the fact that, well, we had an eagle but not the model! However, perhaps this was a blessing in disguise, because this year it happened. We were very excited to do something fun for our portfolios, and we were looking forward to raising the bar with this project. Not with an eagle, but with an incredible falcon named Katara. Katara, the white falcon with her wings wide open. Because I am in California, and the team is in Spain, everything was planned between the two continents. I typically prefer meeting the team I am going to be working with, as well as the animal, beforehand to visualize what and how I'm going to shoot. Then I can assess what works and what doesn’t. This time, I had to be content with back and forth emails and many WhatsApp messages! The same team of professionals from two years ago came together, with a few additions. Katara, of course, would steal the show, as well as his brave and endearing model that bonded remarkably with the predator. The model, the striking Valentine Kozenko, fell in some bushes in the wood just the day before, and arrived all scratched. However, for me, it was perfect, as the wounds look as though they could have been made by the falcon. Everything took place in a studio; Katara was very young and not quite tame. He had to wear a hood, or blinder, at all times. The owner and animal handler, Xevi, explained to me that falcons have “visual brains”, so he had to have his eyes covered. As long as falcons can’t see, they remain much calmer than if they are hoodless, especially when they are young and not fully trained. Falcons, like any bird of prey, are very sensitive to changes in light and sudden movements. It was very important to keep the animal as calm as possible. Despite preparing some ideas and mood boards for reference, I went to the studio without knowing what to expect. This is the most exciting part of my job of working with animals. You never know how it is it going to turn out. One vision I had in my mind that was perfectly clear to me was the lighting. I wanted to imitate the lighting in the baroque era, and was inspired by Diego Velazquez. Before the shooting, I spent a few minutes talking to the model and to Katara's owner to get to know them. It was crucial for me to understand Katara's limits, namely what I could do and what I couldn’t. As always, the animal's welfare is the most important thing for me. For example, Katara was car sick when he arrived. We waited a bit to start the session, but he ended up adjusting very well. Although we were behind schedule (this happens frequently when animals rule the set! ), the session went wonderfully. Just like domestic animals, Katara needed a potty break. He didn’t, however, require frequent treats. He did get rewarded, though, by his owner with fresh meat once he got home. I am so very pleased with the end results; working with like-minded, creative individuals ensures fantastic results. A delightful and enriching time was had by everyone! I am already thinking of next year’s session, and I have a goal of doing a photoshoot with wolves! 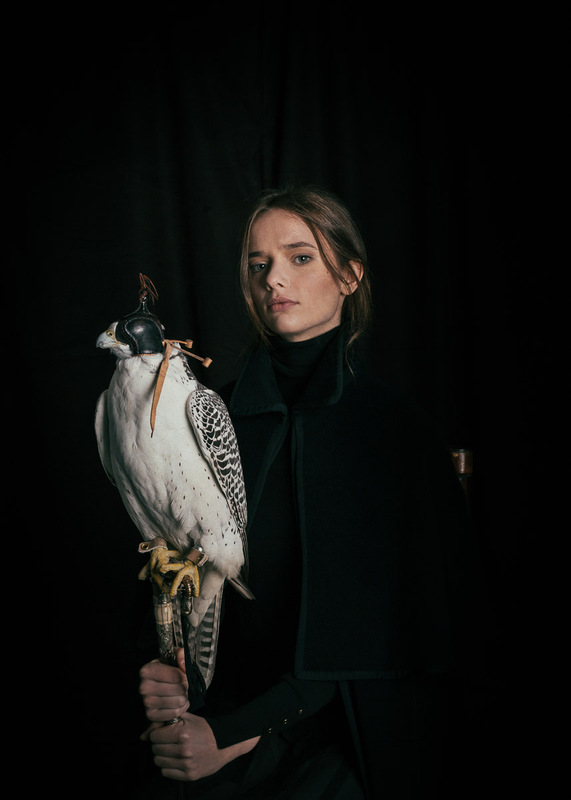 falcon, animal photography, animal photographer, los angeles, wild life, behind the scenes, team work, commercial, editorial.